Drupal 7 – Setup Bootstrap 3 Theme with Gulp for LESS compilation | Eureka! 2. 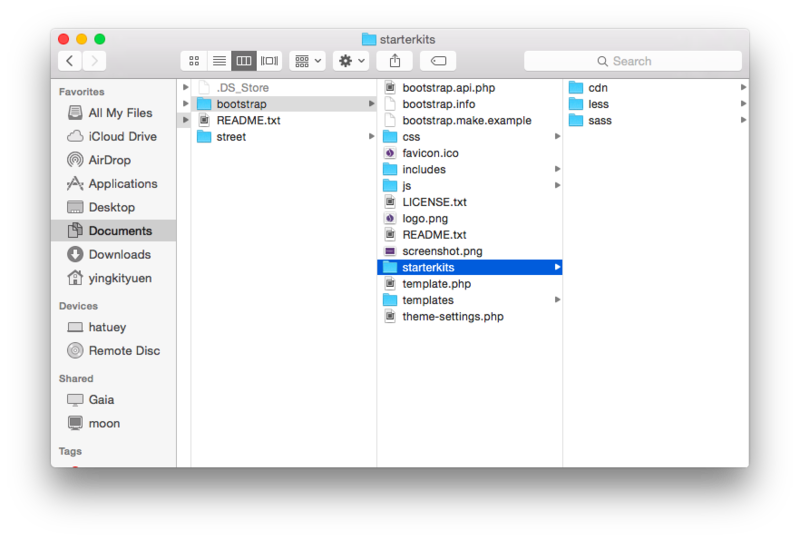 Extract the Bootstrap 3 base theme to the sites/all/themes folder. You would found the starterkits folder containing the subthemes. as follow. 3. There are 3 different ways start the subtheme. less – You have to download the bootstrap 3 source to the subtheme folder. sass – Didn’t try it, guess it is for the SASS version of Bootstrap. 4. Since i would like to use LESS for styling the website, i pick the less starterkit. So copy the starterkits/less folder to sites/all/themes. Rename to folder to whatever you want. In this example, i name it street. I also need to rename the less.starterkit to street.info and update the content accordingly. 5. Let’s take a look in the subtheme less folder. There are 3 different types of .less files. The bootstrap.less and variables.less are from Bootstrap 3 source, we will replace this 2 files from the newly downloaded Bootstrap 3 source. You can edit the variables.less for the Bootstrap basic configuration. 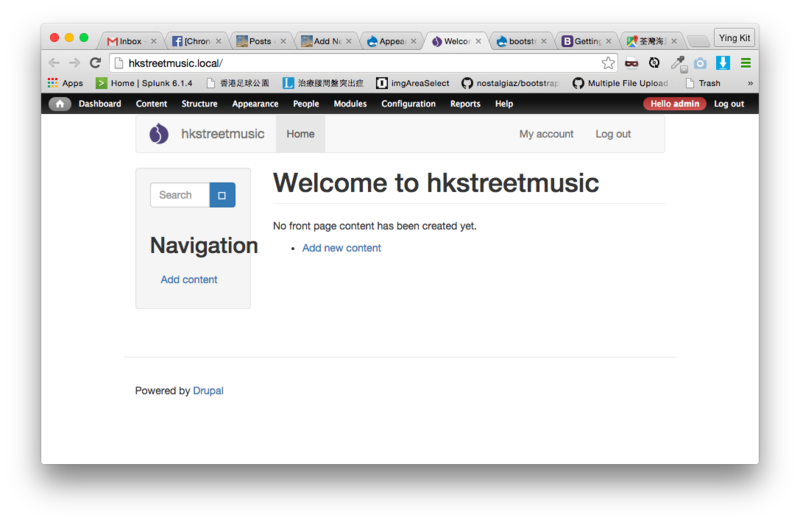 I guess overrides.less is for Drupal to adapt the Bootstrap 3 theme. Only edit it when you know what you are doing. The header.less, content.less, footer.less and style.less are for your custom styling. 6. Download the Bootstrap 3 source and put it in your subtheme as shown in the following picture. 7. Replace the bootstrap.less and variables.less from the Bootstrap 3 source to /sites/all/themes/street/less folder. 8. Edit the bootstrap.less and update all @import as follow. 9. The .less files are ready but we need to compile them into CSS files. Let’s handle them by gulp. Assume you have installed npm, create the package.json in your subtheme folder. 11. 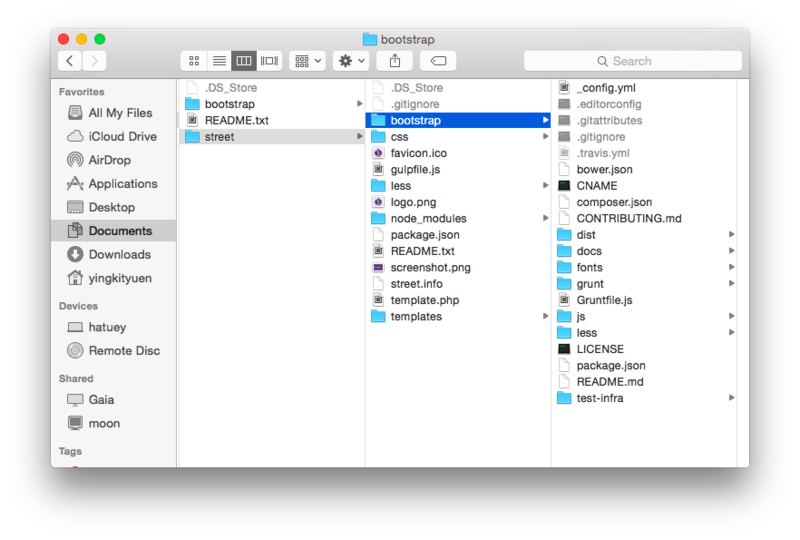 Move to the sites/all/themes/street folder and install the following project packages and save them as devDependencies in package.json. 15. If you can run the above commands without errors, your Bootstrap 3 subtheme is ready. Enable it and see if it works! 16. Note that in the gulpfile.js i have a livereload package so the page will autoreload if the .css files are recompiled. It works with a chrome plugin called LiveReload. For more information, please visit GitHub – vohof/gulp-livereload. Nice tutorial!! I also like Gulp very much!